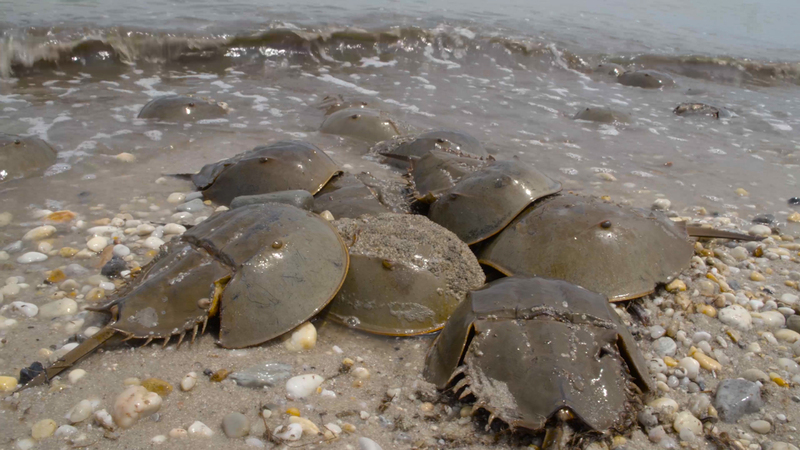 Lesson Plan: What Do You Know About Horseshoe Crabs? Hey it’s Kurt Mann from Ocean Today. Our crew just completed a three day shoot here on Delaware Bay documenting the amazing horseshoe crab. I’m on Pickering Beach where we filmed thousands of horseshoe crabs spawning on the water’s edge. We also joined citizen volunteers who, every year, do a survey to find out how many males and females are coming to the shores and tracking that year after year. Three… four… five… six… seven. Seven males. Without the volunteers, the data just would not be able to be collected by the full time crew… so citizen scientists and volunteers are incredibly important to this mission. Five… six… seven… eight… nine, ten, eleven, twelve… thirteen males. We’ll let you know when the stories are finished. Can’t wait to share them with you. Horseshoe crabs are "living fossils" more closely related to spiders and scorpions than they are to crabs. Because their blue, copper-based blood quickly clots in the presence of bacterial toxins, medical researchers use it to test intravenous drugs, vaccines, and medical devices, ensuring that they are free of bacterial contamination. Loggerhead sea turtles and more than 20 species of migratory birds rely on the crabs’ eggs as an annual boon to their diets.